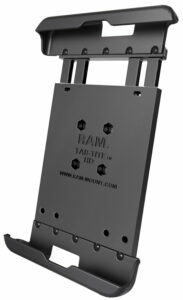 The RAM Cradle range is divided into five main categories Tab-Tite & Tab-Lock, Form fitting, X-grip, Tough Tray and Quick Grip. Each of the cradle categories specialises in different areas. The X-grip, for example, is highly versatile as the grips can be adjusted easily to suits many different models and designs. In contrast, the form-fitting cradles are designed with particular units in mind and will only fit those units, trading versatility for a more secure and snug hold. All systems are designed using the AMPS hole pattern system and are therefore compatible with all the RAM mount unit designs. We'll go into detail on each of these categories along with some examples on which situations suit best to use them. The Tab-Lock and Tab-Tite system are very similar in design however they are designed with very different purposes in mind. The Tab-Tite systems are designed with a quick snap in and snap out features. 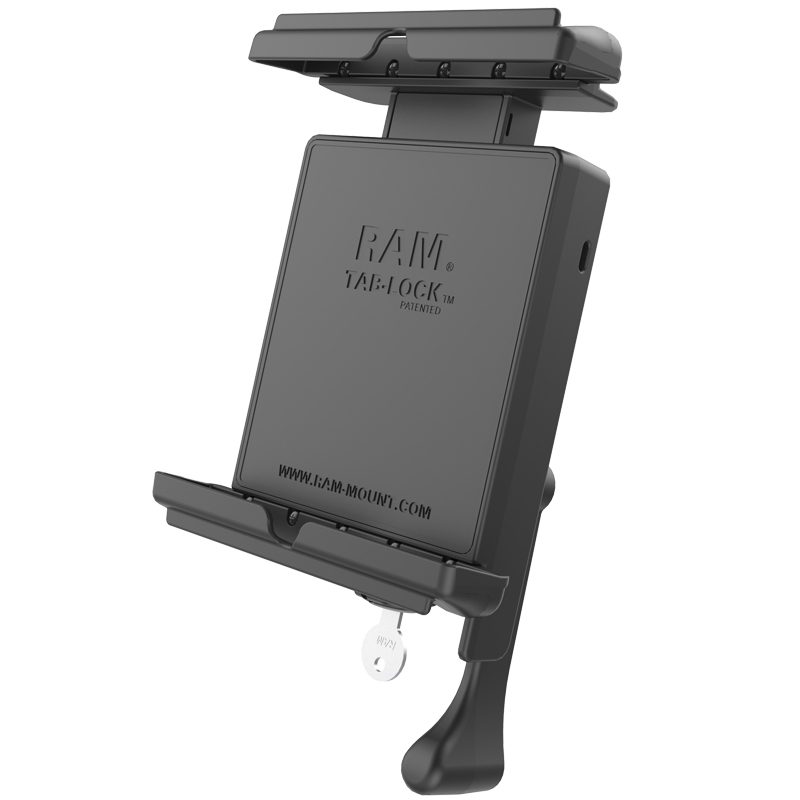 The Tab-lock systems are a more secure system with a locking mechanism to deter theft. 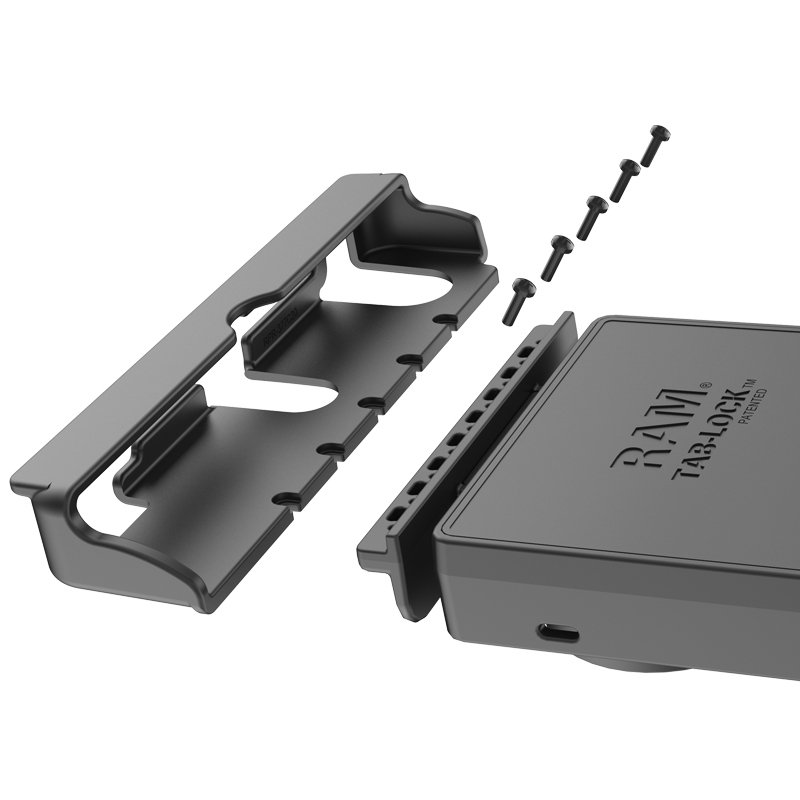 The Tab-Lock system is a permanent solution targeted towards many vehicle fleet companies to securely mount their GPS units or devices while remaining relatively easy to service. The Tab-Lock system uses a key locking system to lock the unit in place. The system is spring loaded in design, to make it easy to install and remove units quickly. 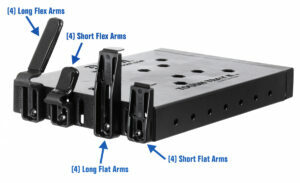 Most Tab-Lock systems are variable in their dimensions and able to fit a range of different units. The units also have custom end cups (the red circled sections in the image below). These cups allow the units to have chargers or other cords plugged in while still being securely mounted. It is also important to check that your device is compatible with your selected cradle. Most compatible devices will be listed either on the overview page of the product or in the compatibility tab shown in the image below. The code for any Tab-Lock system will have RAM-HOL-TABLXXX. In this case, the TAB denotes the unit specification for Tablets. The L following the TAB identifies the cradle as a locking cradle. 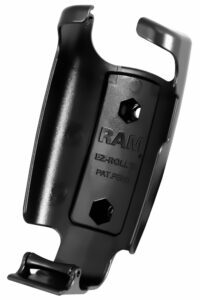 As with almost everything in life, there is an exception to this rule with the RAM GDS charging systems. The code for the GDS charging cradles follow a different pattern RAM-GDS-DOCKL-V2-SAM21U. The GDS charging cradles are designed with particular tablet units in mind as they work with RAM’s Intelli skin cases to allow the unit to be charged while still locked in the cradle. 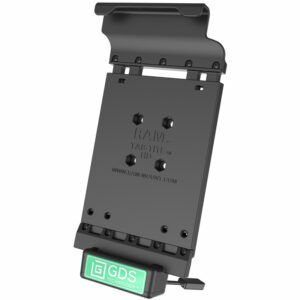 RAM’s product code the GDS refers to the model using a GDS charging dock thereby needing an Intelli skin case on the unit. The DOCK code denotes that the unit is a cradle. The L refers to the system being a Tab-Lock system. The SAM code refers to the brand of tablet SAM being Samsung (for Apple models RAM uses AP to denote the brand). The GDS cradles are the only units that denote a brand as the Intelli skins are designed to fit a specific model. The Tab-Tite systems, like the Tab-Lock systems, are spring loaded for quick release solutions that still give units a secure and snug fit. The Tab-Tite systems also have unique end cups that you will need to make sure are compatible with your device to keep the device charged or plugged in. The code RAM uses for the Tab-Tite systems follows the same pattern as the Tab-Lock system only with the L denoting that a system is lockable. 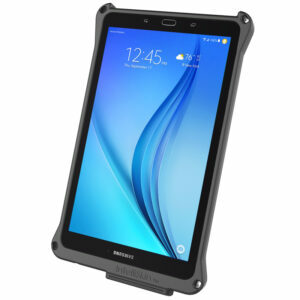 For example, the RAM-HOL-TAB-20U, the HOL in the code refers to the unit being a holder or cradle. The TAB once again refers to the typical device that should be used with this cradle (Tablet). The 20U is a part of RAM’s product codes that differentiate the different models. Custom Form-Fit cradles represent RAMS largest product category. The custom form fit products that RAM produce covers a huge range of Car GPS units, Truck GPS units, Handheld GPS units, Phone Units, Tablet units, Cameras, GoPro units and I could go on but I’ll refrain for your sake. Suffice it to say that, while RAM couldn’t create a custom cradle for every device, they have a very wide selection to choose from. It’s worth mentioning that there are a couple of ‘custom fit’ cradles that RAM produces that are compatible with multiple devices. 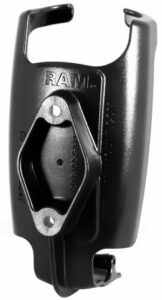 As an example, the RAM-HOL-GA41U featured below is compatible with multiple Garmin handheld GPS devices (for example the Astro 320, GPSMAP 62, GPSMAP 62s, GPSMAP 62sc, GPSMAP 62st, GPSMAP 62stc, GPSMAP 64, GPSMAP 64s, and the GPSMAP 64st). The code breakdown for the custom fit RAM units follows the same pattern as the previous codes. RAM-HOL-GA41U. 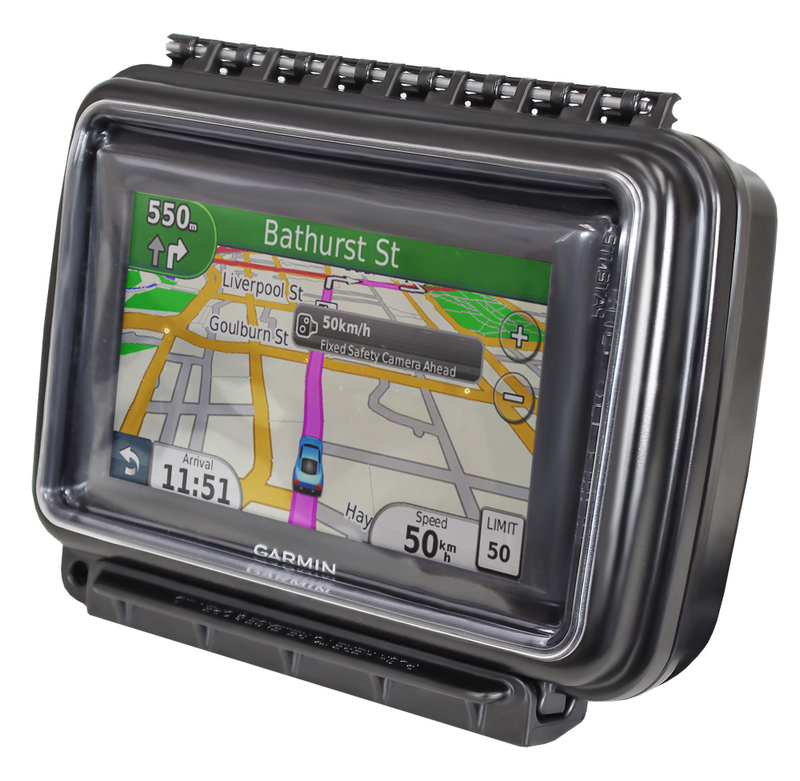 Where HOL refers to the product being a holder or cradle, the prefix letters before the 41U refer to a suitable brand GA in this case meaning Garmin. 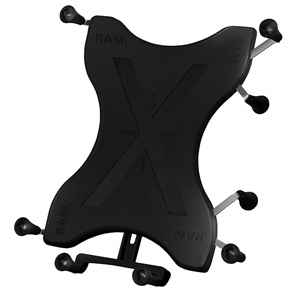 RAM X-grip cradle units are the most versatile cradle units available. The X-grip was originally designed for phones, but with the popularisation of tablets, RAM has since produced X-grips to fit a wide range of smart-devices. The unit on the left is a RAM-HOL-UN7BU is a universal phone X-grip without a base mount. The unit on the right is a tablet X-grip RAM-HOL-UN9U. The UN, in this case, signifies that the unit is a ‘Universal’ fit. The term Universal means that any unit regardless of brand, charging ports, etc will fit this unit if it is within the unit minimum and maximum specifications. 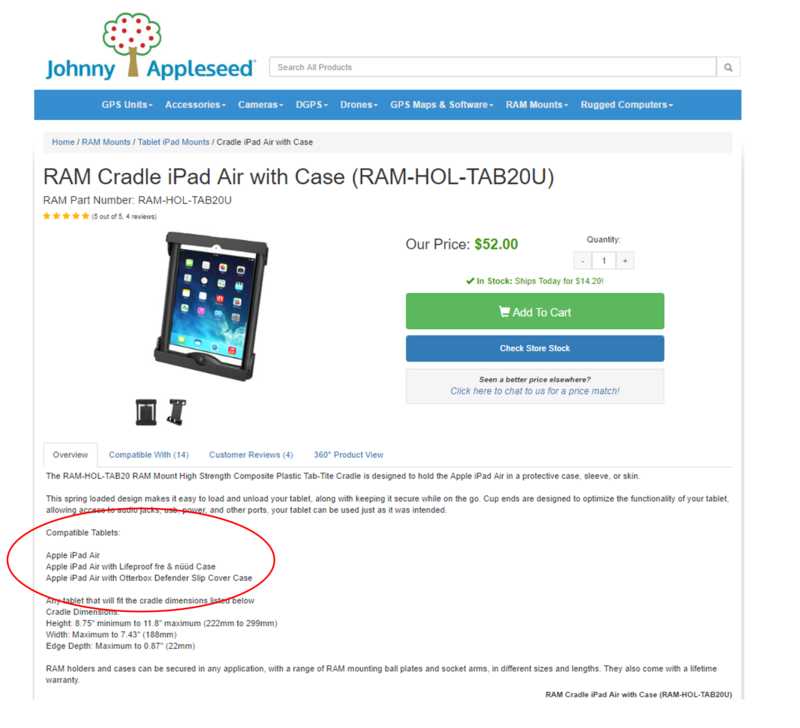 You can find the minimum and maximum dimensions of all the units in the Overview section of the Johnny Appleseed website. 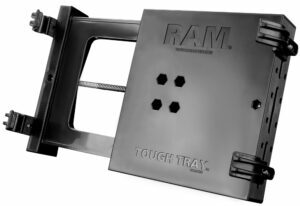 A comparatively lesser known RAM product category are the Tough Tray units. These units are rugged units designed for heavy devices and rough terrain situations. The tough tray units most commonly come as a package deal with a floor mounting passenger seat option. The most common device for a tough tray is a laptop (featured on the right) but RAM also produces tough tray units for Tablets and netbooks (featured on the left). The tough tray units for laptop include clips on the side to hold the laptop keyboard into place the tray. As with all RAM products, you’ll need to know the dimensions of your device to make sure it is compatible with the tray. The tough tray designed for Tablets and Netbooks uses adjustable arms to hold the unit in place. The rubber grip arms on the side of the unit can be raised to a maximum height of 69.85mm. The code breakdown for these units is different to most RAM products as they are typically a much more niche market. The code is used only for RAM’s purposes to differentiate the products. The Intelliskin case range is designed to be used with RAM’s GDS technology. All Intelliskin cases are a custom fit design that will *NOT fit other models. The Intelliskin work by inserting an adapter into your device that will allow it to link with any GDS dock you use. 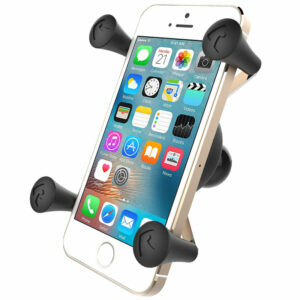 The GDS dock can be used to charge or link your devices easily.